An inspirational Clonmel teacher has won an international Rotary Young Citizen award for her selfless work in the community from a young age. Twenty four year old Charlotte Keane was honoured this week when named as a Britain and Ireland Rotary Young Citizen Award winner. 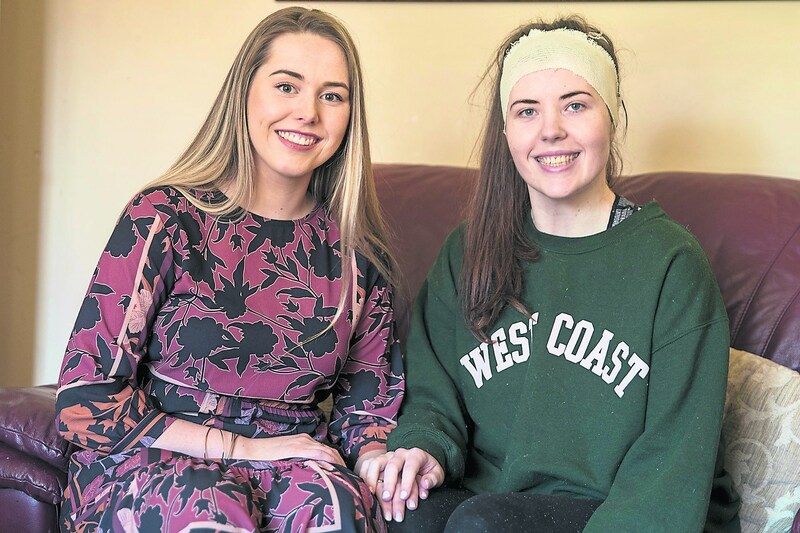 Rotary recognised Charlotte for her "selfless and unwavering friendship and support " to her friend and former Loreto Secondary school classmate Emma Lacey who is battling life changing spine and brain conditions for over six years. Charlotte was put forward for the Rotary award by Emma who described her friend as "an inspiration to all that come in contact with her” . Charlotte (pictured below with Emma) helped set up Emma Lacey Trust which has received phenomenal support from the community in their campaign to provide an accessible downstairs extension for Emma and to cover future medical costs. “Receiving this award is a huge honour, as it represents a whole community of people who came together to support Emma and her family in their time of need. Being involved with such an inspiring, devoted and compassionate team has been an extremely moving experience for me.” said Charlotte. “Emma is surrounded by wonderful friends who continue to support her. Our faith has brought Emma and I together, and I hope that this award will motivate young people to practice their faith, become involved in their communities and be kind to one another.” said Charlotte. Charlotte , has been described as a person who “always puts others ahead of herself” . Her friend who put Charlotte forward for the award, Emma Lacey, said Charlotte was a wonderful person with such a big heart and was a deserving recipient of the prestigious Rotary award. “Life can be lonely confined to bed but Charlotte always manages to bring the light of the outside world to me with her friendship” said Emma who has battled bravely through multiple operations for over six years for spinal and brain conditions. Since the age of ten, Charlotte has been heavily involved in her local community and has encouraged other young people to volunteer in various activities, including setting up junior choirs and a playgroup in St Mary's parish. Charlotte, graduated with a first-class Honours Degree in Education. She was offered the President’s Scholarship to do a Master’s Degree. Charlotte accepted but decided to gain experience in the teaching world first before her Masters and is currently working as a Learning Support Teacher at Ss. Peter & Pauls primary school in Clonmel. Charlotte will receive her Rotary award, a trophy and £500 to go towards her chosen charity or project, from BBC TV presenter Ellie Crisell at the Rotary International in Great Britain and Ireland Showcase (Conference) in Nottingham on Sunday, May 12. Charlotte is a daughter of Edel and Martin Keane. She has one brother Joseph and they live in St. Patrick's Terrace in Clonmel. The Rotary Young Citizen Awards celebrate the amazing achievements of inspirational young people, under the age of 25, across Great Britain and Ireland, many of whom have assumed important responsibilities at a very young age. Clonmel Rotary Club President Joe O'Sullivan said members were so impressed by the strong recommendation from Emma, made from her hospital bed, that they had no hesitation in nominating Charlotte for the award. Paudie Everard, chairman of the Emma Lacey Trust, said Charlotte was a valued member of the group that came together to support Emma and her family.